Hydraulic cylinders are linear actuators that are used in both large and small industries. They exist in both manual and auto tools to move workloads using straight line pushing, pulling, lifting, clamping and steering forces. They can produce about ten times the power a similar sized electric motor can produce. Hydraulic cylinders come in various sizes ranging from the size of your arm to the linear actuators you find in ships, mining trucks, and oil rigs. They comprise a piston and rod assembly and uses the help a hydraulic fluid’s flow pressure to icreate the mechanical force and straight-line motion. They have varied applications in the automotive, drilling, mining, shipping, warehousing, machine, and civil engineering industries. Whatever the cylinder’s size or purpose, it’s necessary you choose the right hydraulic cylinder to meet the specific application you need it for. They have to be chosen wisely because it’s the hydraulic cylinder that makes a hydraulic power system work without the use of any conventional mechanical gears or levers. There are various factors you have to take into consideration to make this choice, which is listed out in this hydraulic selection guide. When it comes to choosing a hydraulic cylinder, you have to make your choice mainly based on where and how you will be using it. different applications require different types of cylinders, and in some cases, the cylinder may even have to be customized as per requirements. Tie-rod cylinders are most common in the US and used in plastic tools and all types of machine tools. They are generally restricted to withstanding a maximum operating pressure of three thousand psi. The cylinders have threaded steel tie rods on the outside to provide for extra strength and stability.. While these cylinders are designed based on NEPA standards, it is possible to exchange its measurements and pressure ratings with any other similarly built cylinders. These cylinders are also called mill-type cylinders and come with heavy-duty housing and a barrel that’s welded or bolted to the end cups without any tie rods. They are ideal for use in higher pressure applications because they can withstand a maximum pressure of 5,000psi or more. They are used more in rugged applications like presses, offshore settings and steel mills where there are lots of temperature fluctuations and a harsh working environment. These cylinders are most commonly used by European manufacturers in practically all their general industrial applications. While they do at times use tie rod cylinders, it’s usually for lower-pressure applications of about 2,350 psi pressure. However tie-rod cylinders are a cheaper option when compared to the mill-type cylinders, which explains why it’s so popularly used n the US. While NEPA cylinders are standard in size and its specifications like pressure ratings, dimensions, and type of mounting, most of the time cylinders are customized as required for the application. Engineers customise the cylinders to change its port size, mountings and configuration so that it can be safely used in a particular application. You have to make your choice based on the mass the cylinder has to move. Once the mass is decided upon, you have to think about how the mass will affect the force needed to move it. This is essential because, for example, 1-ton mass needs the same amount of force is needed to move straight up. However, it’s when the mass needs to be pushed horizontally like on the ground, it requires just enough force to accelerate upon overcoming friction. No matter where and how you plan to use the cylinder, its force should be more than enough to compensate for any possible margin of error. It’s not only the force; you also have to make your selection based on the geometry for moving it. Machines like hydraulic presses that move up and down work based on simple geometry. It’s when it comes to other machines like a crane, where the center of the load that’s to be moved doesn’t coincide with the lift force but is instead perpendicular to the point of lift force that the required cylinder force changes. In this case, the boom is pushed far away from the load by the cylinder. In fact, most of the time the load distance or the distance from load to fulcrum ends up more than ten times the lift force, which is the distance from the lift force to the fulcrum. This implies that the cylinder lifts the load using more force if the point of lift is closer to the fulcrum. It’s after finding out the cylinder’s required force that you next have to calculate to determine its required bore size. This is determined based on the amount of force the cylinder produces. And this is calculated by multiplying the system pressure with the internal piston surface area upon which the pressure acts. Now that you know the hydraulic cylinders minimum bore size, you next have to choose the ideal cylinder’s rod size. Most hydraulic cylinders come with one or two rod options. The right rod is selected based on the necessary stroke length which in turn has an effect on the rod’s buckling strength. Programs are generally used to decide if a given rod size and stroke’s buckling strength is suitable for its given load. While selecting rods, a bore’s smaller rod should be used only for short stroke push loading or in reduced pressure applications. The larger rod should be used in cases depending on the rod’s maximum reliability and fatigue life. If in case the desired rod diameter is more than the largest in the selected cylinder bore size, then it’s time to reconsider the cylinder’s design parameters. It’s usually in these situations that the application needs a customised hydraulic cylinder. Even the bearing load has to be taken into consideration while choosing a hydraulic cylinder. This is because the resultant bearing load on the piston increases as the cylinder’s stroke length increases. It can lead to the rod bending due to its own weight and in turn, lead to the wear and damage of seals and bearings. So rods that may bend or end up misaligned with use require additional support. This is where stop tubes come in handy to increase the cylinder’s bearing area and prevent it’s wear and tear. They are most often used in applications having greater than 1000mm strokes. Another support option is using larger diameter rods which are also stronger. But as it also heavier and may end up self-defeating, the proper calculations have to be done before using it. Sometimes you may even have to provide the rod with some eternal mechanical support like a saddle-type bearing. Hydraulic cylinders are divided into two types, based on its mounting style, which is either pivot mounting or straight line mounting. Pivot mounted cylinders are used where a load has to be moved through an arc and includes mounts like clevis and Trunnion. Straight line mounted cylinders are used where the load has to be moved in a linear direction. It includes rear or front head flange and foot mounting. A hydraulic cylinder has to have the right seals because they are instrumental in preventing possible oil leakages. This, in turn, ensures continuous, flawless use of the cylinder. The seal has to be chosen based on the cylinder’s applications, operating environment, and the maximum operating pressure it can withstand. • Hydraulic rod seals like u-cup and step seals prevent fluid inside the cylinder from leaking outside. • Hydraulic piston seals like low friction, 5-piece and crown seals help prevent fluids from flowing across the cylinder’s head. • Wiper or dust seals prevent any contaminants from entering and contaminating the cylinder. This is necessary because external contamination can be disastrous. Examples of these seals are double and single lip wipers and metal covered wipers used for heavy duty applications. • O-rings like NBR with 70 Shore hardness prevents oil leakage in general applications. 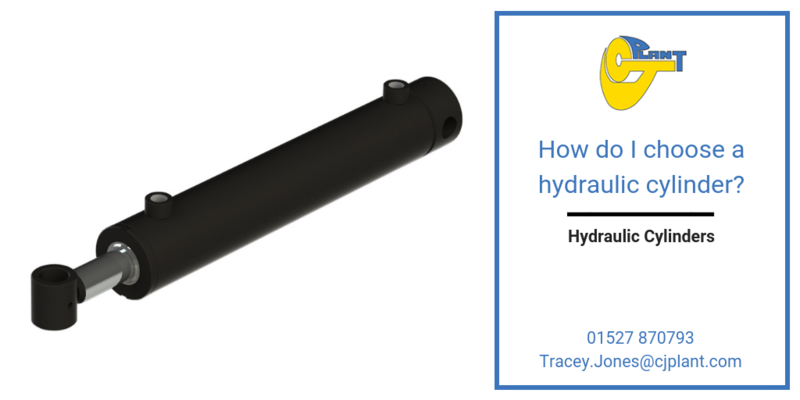 • Are cushions a necessity in hydraulic cylinders? It depends. Internal cushions may have to be placed at the cylinder stroke’s ends. This is decided upon after the cylinder’s bore, rod and stroke sizes have been determined. Cushions are generally used in cases where high-speed rods have to be decelerated. They help reduce the impact energy of the piston assembly against the cylinder end cap and in turn prolong the cylinder’s life. They are not always required and are an optional inclusion in the hydraulic part. They are either used at one or both ends of the cylinder and its presence does not affect the cylinder envelope or mounting dimensions. 8.Is force integral in selecting hydraulic cylinders? Yes, it’s because hydraulic cylinder depends on force, which is applied to one of its ends and transmitted to the other end through incompressible fluid oil. The force always multiplies during the transmission process, which is how the cylinder moves a workload. It is determined based on the cylinder’s bore diameter and operating pressure.